Apartamentos Salmerones, in Alhama de Granada. - From Granada (36 mi or 59 km, 54 minutes): Take the A-92 highway to Malaga and take the exit called Moraleda de Zafayona y Alhama de Granada, which is the 211 km. - From Malaga (49 mi or 79 km, 1 hour 15 minutes): Take the A-7 highway, coastal road towards Motril-Almeria, until Velez-Malaga. Then take the A-335 to Alhama de Granada. - From Malaga: The Malaga Bus Station telephone number is (+34) 952 33 00 61. You can buy your tickets at the website http://www.alsa.es/. To go from Malaga to Alhama de Granada you have to go first to Torre del Mar. The bus to Torre del Mar leaves the Malaga station approximately every 30 minutes. In Torre del Mar take the bus to Alhama de Granada. - From the Granada airport (30 mi or 49 km, 45 minutes): You can take a taxi at the airport for 60€ approximately. - From the Malaga airport (56 mi or 91 km, 1 hour 19 minutes): You can take a taxi at the airport for 100€ approximately. 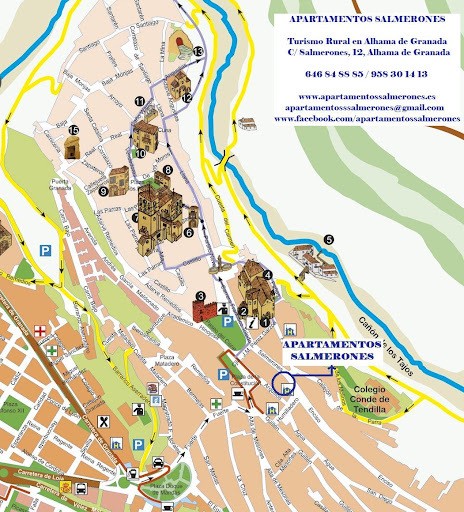 Have you ever been in the Apartamentos Salmerones? Add us on Facebook and tag us in your photos. Share your experience!